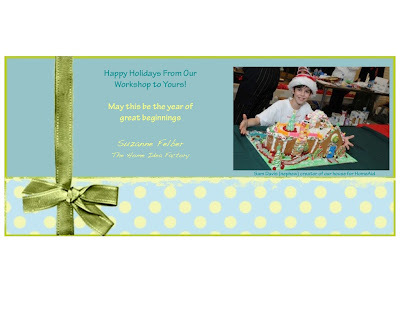 From our workshop to yours- Have a great holiday season! Builders, chefs, and community members teamed up today to start the “Home Sweet Gingerbread Home” competitions at NorthPark Center. Lifestylist® Suzanne chaired the event which looks like it will become an annual favorite.Chef and cookbook author Karel Ann Tieszen teamed up with Shared Housing board member Mona Lincoln and TX State Fair Celebri-chef Peter Clarac (he was a winner in the Oprah cook-off) to decide which of the houses would be awarded the coveted blue ribbon. Pastry Chef Instructor at the Art Institute of Dallas Nina Hunter amazed the judges with her beautiful victorian home complete with playful penguins enjoying the pool in the backyard and was awarded first place. Thursday the “Builders and Bakers” competition will be taking place from 12pm to 4pm also at NorthPark. Teams comprised of members from the Home Builders Association of Greater Dallas will be creating homes on-site with celebrity chefs from Stephan Pyles, Sambuca, Old Hickory Steakhouse at the Gaylord Texan, DC’s Catering and The Cupcakery. They will then be judged and awarded various prizes in different categories. The competitions will benefit two great organizations - Shared Housing Center and HomeAid / Homebuilders Care, both which break the cycle of homelessness and abuse in the Dallas area.